It’s a new tradition. Giving Blueday is U-M’s version of Giving Tuesday, the global day-after-Thanksgiving-weekend that is dedicated to giving back and generosity. Tuesday, December 1, 2015 will mark Michigan’s second annual Giving Blueday in support of the university and its students. And you are invited to help transform lives, shape the world, and make great things happen. On this special day, you can make a donation to any area of your choice at the university. Gifts of every size will make a difference, and your gift could go even further through matching gifts and challenges you can participate in throughout the day. Student organizations can raise funds for the cause of their choice, plus compete to win funding for their org at the same time. Student orgs can qualify for several challenges that would win them up to $3,000 for their cause. Plus any student who gives to U-M on Giving Blueday will have their gift automatically matched. See Money for Your Student Org for details. Directly support the students you care most about, and you could help them and their organization win challenges throughout the day! 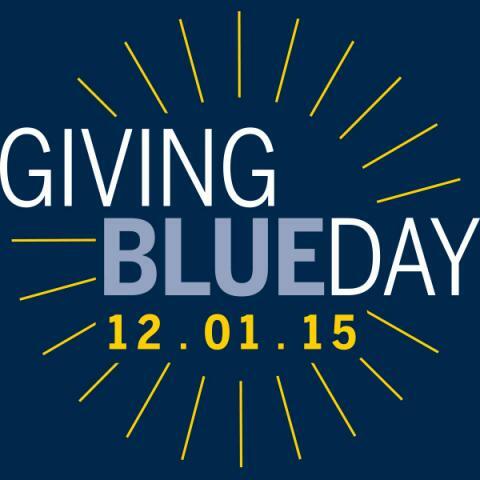 Giving Blueday was kicked off in 2014 when the U-M community exceeded our goal of 1,000 donors and $1 million raised. In fact, 5,437 donors gave more than $3.2 million. Students contributed heavily: 1,659 students gave, and more than 80 student groups raised money for their U-M causes. What was the effect? Watch this Thank You! Giving Blueday Video to find out. Please consider making a gift on December 1 for your favorite U-M cause, including any Student Life area. You can give online at GivingBlueday.org. You can also spread the word: tell your family and friends, and become an M-bassador to leverage your social networks for Giving Blueday. Join us. Be a victor for Michigan.